The Southern live oak (quercus virginiana) is a subevergreen oak tree native to coastal areas, ranging from tidewater Virginia south to Florida and west along the Gulf Coast as far as Texas. 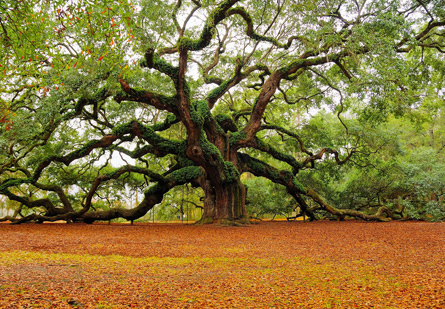 Live oaks can live for many centuries and grow into massive trees, the wizened elders of the coastal lowlands. They stand sentinel over the Gulf Coast, their twisted branches and gnarled trunks witness to countless storms. The live oak’s massive, spreading branches fight a courageous battle against the force of gravity and, with great age, gracefully droop to rest upon the ground. For their neighbors, the Southern live oaks are symbols of strength, beauty, and hope. Next: A description of the Southern live oak.